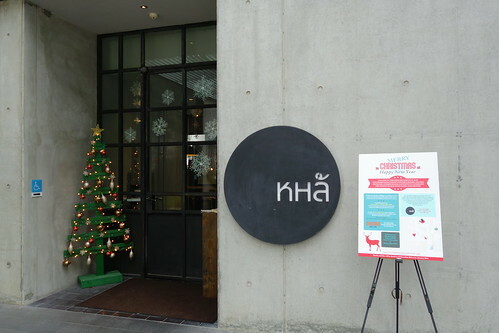 Kha has been my favourite Thai restaurant in Singapore for the past year or so but come 16 January, the restaurant will shutter for good. Get your fix within the next day or two if you can secure a table. The last of the three restaurants within the Epicure Group (a subsidiary of JIA Boutique Hotels) to close, Kha's sister restaurants were Graze at Rochester Park and Bomba Paella Bar. Kha serves Northeastern Thai cuisine from the Isaan region that's known for Som Tam, grilled meats, glutinous rice and Muay Thai. 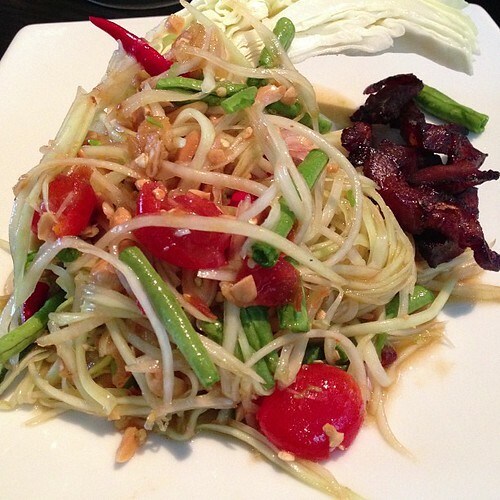 A dish that most Thai food lovers are familiar with is Green Papaya Salad or Som Tam. Called Som Dtum Malakor at Kha, the dish includes a side of candied pork. Although pork is not one of my favourite meats, I love Thai candied pork because of the smoky-tasting caramel crust that encases the tender chunks of meat. The crunchy strips of green papaya were not excessively sour and the salad dressing wasn't too salty or sweet. In all a refreshing start to the meal and worth a try if you like Green Papaya Salad. 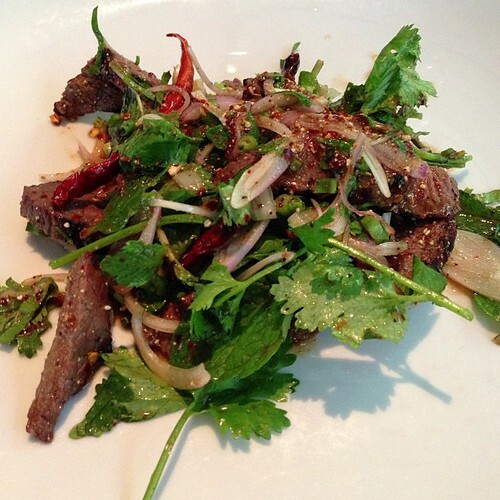 One of my favourite dishes at Kha is Nahm Dtok Nuer (Spicy Grilled Wagyu Beef Salad with Shallots, Coriander, Mint, Lime, Fish Sauce and Toasted Rice Dressing). The succulent Wagyu Beef slices had a lovely smoky flavour from the lightly browned surfaces. The salad dressing was well-balanced as the strong savoury fish sauce was tempered with the tartness of lime juice and the refreshing herbiness of mint and coriander. This dish is a Must-Try! The first time I ate Pla Mauk Yung at Kha, I felt that the grilled squid wasn't browned sufficiently. As I continued digging into the dish, I realised that the squid was flash-grilled to retain as much moisture as possible whilst keeping the squid pieces tender and soft. 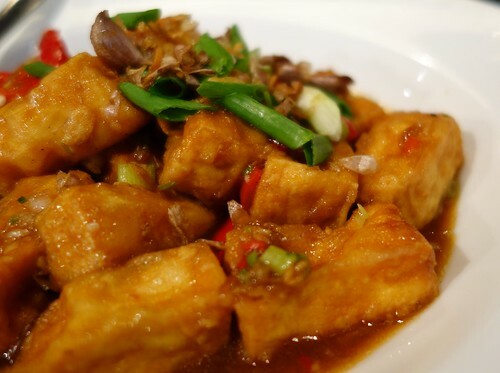 Though the Pla Mauk Yung didn't have a strong smoky flavour from charring that most grilled squid dishes have, it had a delicate and natural sweetness from the fresh squid with a hint of smokiness. An added bonus to flash-grilling was that the squid had an almost marshmallow-like texture. A Must-Try! Baby squid deep fried until crispy, then tossed in red tumeric and garlic. 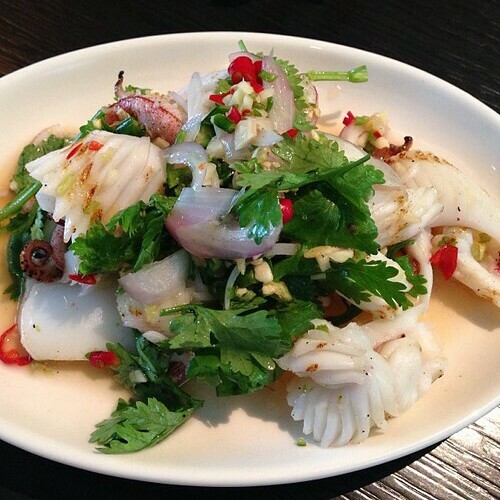 Kha's menu also features a deep fried baby squid dish. 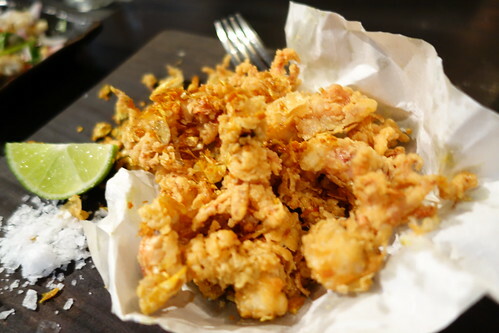 The light and tasty batter is crisp whilst the baby squid is tender and juicy. The dish reminded me of Hong Kong-style Squid fried with Chili and Salt 椒盐墨鱼. This dish is worth a try but if I had to choose just one squid dish, I'd pick the grilled squid. I fell in love with this dish the first time I tried it at Kha. One of my favourite dishes on the menu, the chicken thigh was juicy, tender and tasty with a hint of spices while the chicken skin was crisp. Though the dish is served with jhim jeaw, a sweet and spicy dip with a honey-like consistency that consists of dried chillis, fish sauce, Thai palm sugar and black roasted rice flour, I preferred the chicken on its' own. This is also a Must-Try! The chopped duck meat salad was tasty and tender with a slightly spicy dressing. I'd pick the Wagyu Beef Salad and Grilled Chicken Thigh over the duck salad. This is worth a try if you love duck. 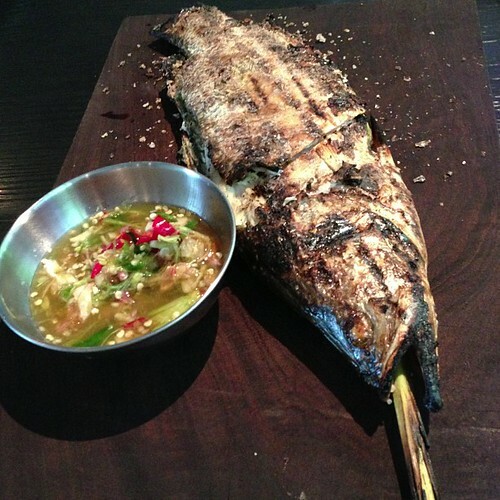 One of the dishes that most guests rave about is Pla Phao Glua, Salt-crusted Whole Seabass. The salt-crust protects the fish from drying out as it's slow-cooked over fire to a juicy but smoky finish. The Lemongrass stalks, Pandan leaves and Thai Basil stalks add a lovely fragrance and flavour to the fish. The tangy and spicy green chili dipping sauce lifts the flavour of the dish a notch and is perfect when eaten with some steamed Sticky Rice. This is definitely a Must-Try! The dishes here go well with Steamed Sticky Rice, the starch of choice in the Isaan region of Thailand. 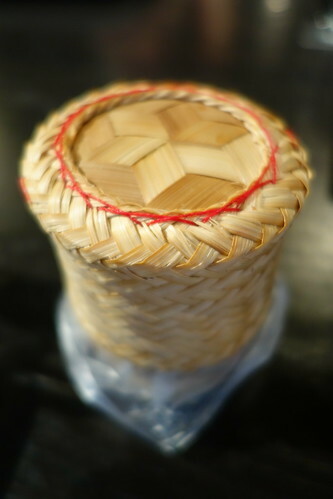 If you're not consuming all of the sticky rice at once, you might like to keep the remainder covered in the basket so they stay warm and moist. 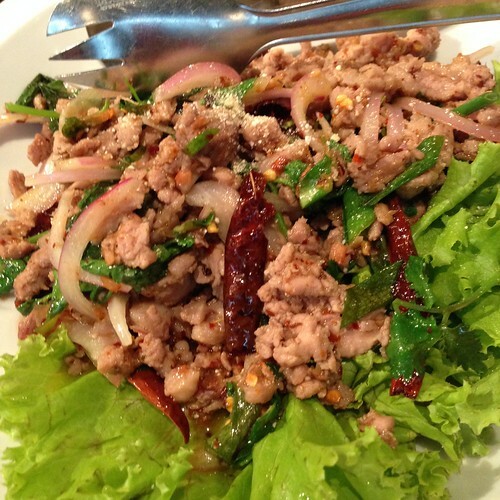 Another well-known Thai dish, is Phad Bai Ka Pow. 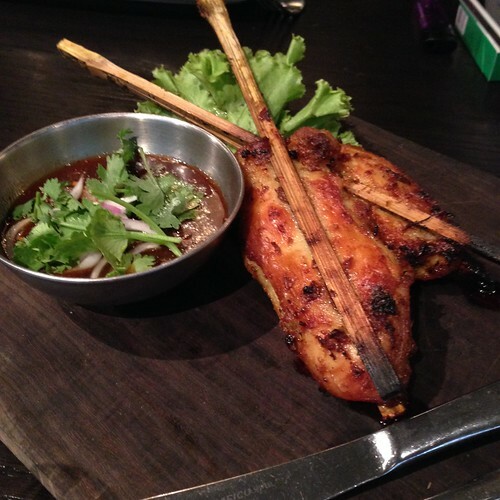 Kha offers diners the option of having pork or chicken in this dish. We opted for the more popular porky version. 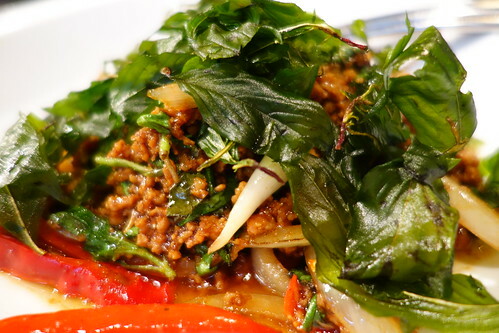 The stir fried minced pork was tasty and infused with the spicy flavour of Holy Basil. I loved the crispness of the Holy Basil that had been deep fried to give it a crisp sheen without drying it out. This dish is perfectly complemented with rice and is also a Must-Try! This vegetarian dish sounded interesting. Unfortunately, it arrived after all the tastier meat dishes and thus seemed to pale in comparison with the rest of the meal. Perhaps I'm more of a carnivore than I thought I was. 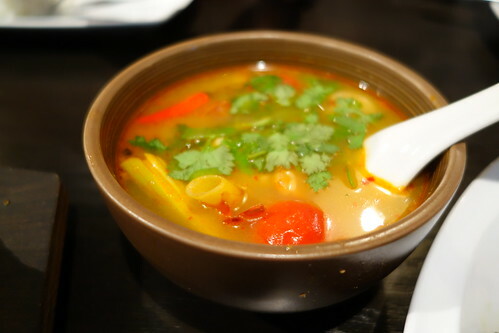 If you absolutely have to have Tom Yam Soup, Kha's version isn't as strong-tasting as the versions that I've gotten accustomed to so it might disappoint you. I think Kha fares far better with their grilled and meat dishes. 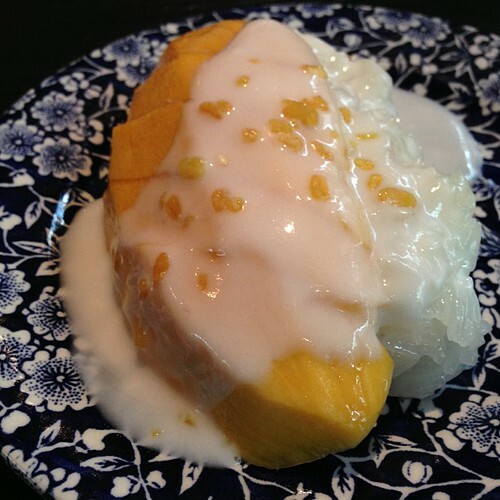 Mango with Sticky Rice is my favourite Thai dessert so I had to order it! The ripe mango was sweet with a very slight touch of tartness. 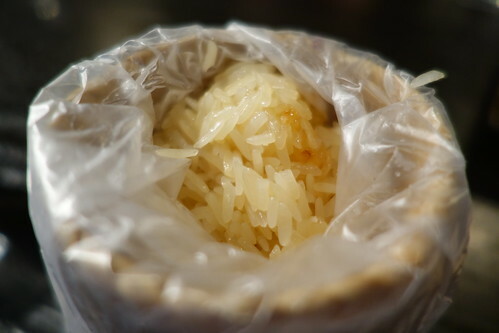 The pearlescent and fluffy grains of sticky rice were coated with a sweet, fragrant coconut sauce. This is a Must-Try! Following Chef Adam Cliff's recommendation to try the Kanom Dtom instead of the usual suspects, I tried this dessert in addition to Mango Sticky Rice on my first visit. I still order both desserts during every visit. 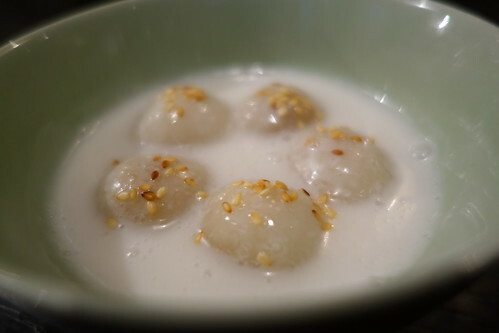 The rice dumplings are like a combination of Chinese Tang Yuan (glutinous rice balls cooked in a sweet soup) and Kueh Tutu as each sticky dumpling contains a filling of grated coconut that had been cooked with palm sugar. The slightly salted coconut cream enhanced the flavour of the dessert. This is also a Must-Try! 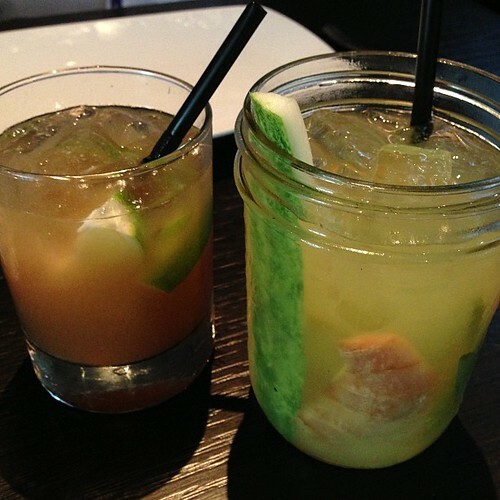 Two of the most popular cocktails are the Tamarind Whiskey Sour and the Thai Basil Cooler. Though I like Brandy, I preferred the Tamarind Whiskey Sour because it tasted like a more well-balanced drink to me with the fruity but sourish flavours of lime and tamarind sweetened with palm sugar and Bourbon. The Tamarind Whiskey Sour is worth a try if you like whiskey. I'll definitely miss Kha when they close after 16 January but I'm glad that Australian Chef Adam Cliff hasn't moved too far away and that I'll still get to savour his cuisine at Chachawan when I next visit Hong Kong. Chef Adam is a protégé of famous Thai cuisine Chef David Thompson. In addition to working in some of the world's most famous Thai restaurants such as Michelin-starred Nahm London and Nahm Bangkok, Chef Adam also spent many years travelling around Thailand and learning about their culinary culture. I started off a sceptic but Chef Adam has changed my mind about a farang's* ability to execute Thai cuisine well. * PS: "Farang" is a Thai slang for foreigner. I used to travel to Bangkok pretty often for business and picked up some phrases from my Thai counterparts and people I met along the way who corrected my bad pronunciation whilst reading off a phrasebook.